The miserable Mill says it all really doesn't it about how the three Baudelaire's have gotten along thus far. discovered. Can the children get away this time? I must admit having read this series of books before when i was a young child i couldn't remember this one at all so it was nice to read it as if it was the first time i had read it. I enjoyed the plot and i am still loving the characters. I found i really liked Charles but i thought him to be a bit useless as he promised to help but his idea of helping was of no use at all. I found Sir to be almost as bad as Olaf himself and should certainly never been allowed to take charge of children, he is a wicked man and again i found myself angry with Mr Poe for the usual reasons but also for wanting to leave the children with Sir at the end of the book. How anyone could leave children with a man like that is beyond me so again i found myself furious with Mr Poe. 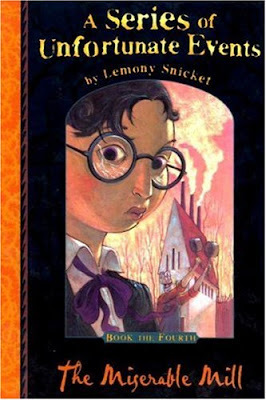 I find i am really enjoying Snicket's Literary techniques i have never read a book which uses these techniques before and i find it quiet refreshing, like i have said in my previous post, i have read posts where people find this technique to be extremely annoying and condescending but i personally enjoy it.